← Corvair College #26 and #27 notes. Friday out of shop until 4pm. It’s 2;30 am here, and in another 4.5 hours we will be starting a 1/2 day tour of our CNC machine shops in central Florida. While the day before we leave for a College or an airshow is busy, there is usually a time crunch about 10 days before departure when we get the last round of material into the machine shops, the last parts into the powder coater, and the last orders into the print shop, so the can get picked up a week later just before we depart Florida, In the case of CC#26-Zenith open house ’13, the crunch day is 9/6/13, today. The loop down through central Florida is about 325 miles of driving. I am starting early, (that is why I have been asleep for hours, this is just my clone sitting at the keyboard sipping coffee and typing this) and I am shooting to be back in the shop by 4pm est. I will be in the shop all weekend, If you would like speak on the phone, just call 904 529 0006 or send an email with your number and a good time to call. Looking forward to speaking with each of you. Blast from the past, winter 2005: Sebastien Heintz, Grace and myself in the Zenith hangar, one of our stops on the 5,000 mile Midwest night school tour. (http://www.flycorvair.com/midwest05.html) Eight and a half years ago, but just looking at the photo brings back a lot of memories of time well spent over the years. 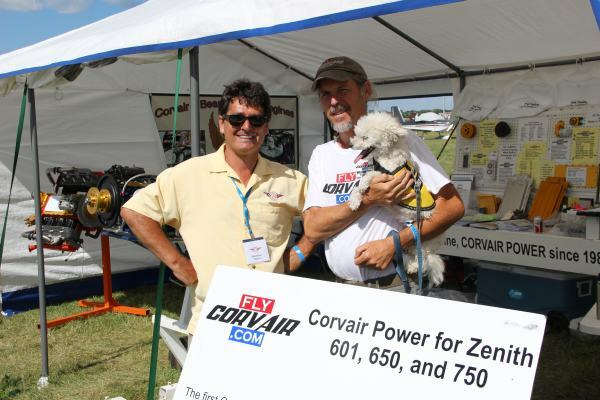 Grace never ages, but just for fun compare Sebastien and I in the 2013 Oshkosh photo below. He looks twice as laid back and I look twice as old. At least the dog looks good with whiskers.